Today was the first day of starting over to find out what is bothering Billy Ray and causing his increased agitation/aggression. I am exhausted but it seems important to share this process with you. Billy Ray was awake at 4:30 a.m. having fallen asleep early last night and only waking once during the night. We did get some sleep albeit in two parts. I am thankful for that. Keeping him in his room so as not to wake up my husband, I put a movie on for him and sat reading his journal (on the computer in his room). It does appear that we have a conflict going on inside of Billy Ray that I suggested yesterday, he wants to be busier, is more confused than normal and is not physically back to normal from the health crisis he is trying to overcome. I think I figured out at least one small thing that may help and created a visual for it. I learned a hard lesson for our long time developmental pediatrician, Dr. Mary Lynn O’brien. That was to evaluate the risk in letting Billy Ray do an activity opposed to the loss in the quality of his life if he does participate. His present support staff is a caring man who is very protective of Billy Ray. He is worried if Billy Ray comes near a hot stove he will get burned. That is certainly a risk. In teaching Billy Ray to do as many independent tasks as possible I try to teach him to do them safely. See the above picture. It is not the best quality picture but I think you can see what I am saying. 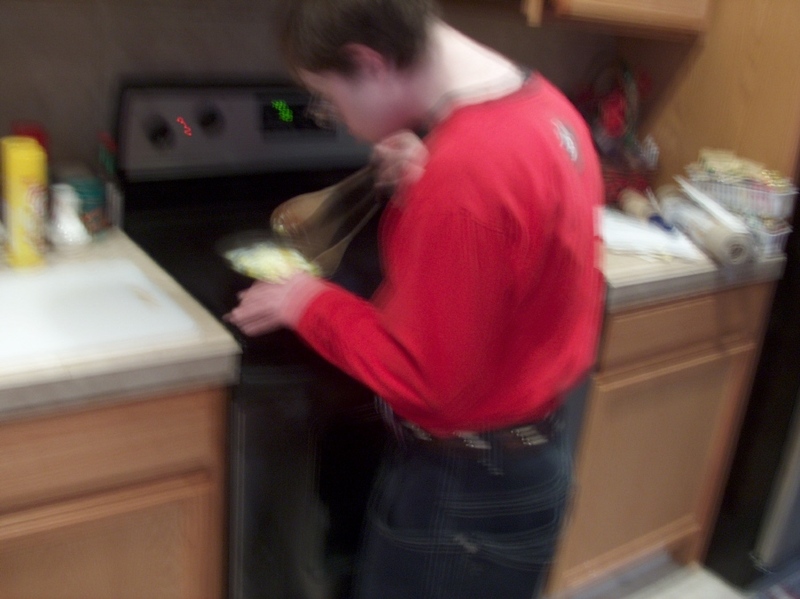 He is taught to hold onto the handle of the skillet while scrambling his eggs and to stand slightly back. He is able to do a pretty good job of it. His self esteem is enhanced by cooking his own breakfast. It is probably worth the risk of a burn, as long as we minimize the risk as much as possible. I am sure this is not the only issue. I looked at the schedules before we moved (just before Christmas) and before he got so sick early summer. There is a long ways to get him back to normal for him. Baby steps and adapting will be necessary. Communicating with Billy Ray and with the professionals involved are also going to be needed. We started again today. We will keep you posted how it goes.